Medal of Honor winner Desmond Doss is becoming very well known. As many of you know, our school was recently invited to the Lynchburg City Council for a special presentation about Desmond Doss. You can read that story here. Below is the press release from the City of Lynchburg. What an honor for Desmond T. Doss Christian Academy to be on the receiving end of this presentation in Desmond’s honor. Desmond continues to reach others some 70’s years after his heroic actions during the Battle of Okinawa. His faith is so inspiring. He lived what he believed, and God blessed him for it by using him during the war greatly as a result—and God is still using his story of faith and heroism now to teach others about true faith in God. 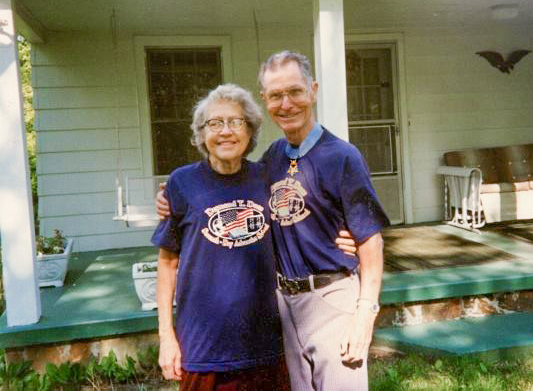 The two pictures in this post show Congressional Medal of Honor winner Desmond Doss and his wife Frances. 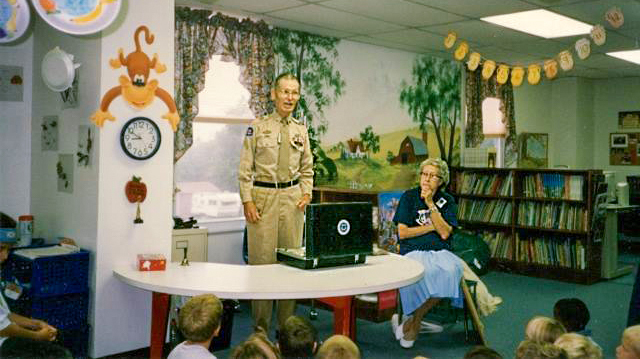 One is of the two of them in a classroom at Desmond T. Doss Christian Academy speaking to students about his actions on Okinawa, and the other shows the pair sporting their Desmond T. Doss School t-shirts at their home. You will notice that Desmond is wearing his Congressional Medal of Honor around his neck in this photo, as well. On Tuesday, October 25, Lynchburg City Council will recognize the service of Desmond T. Doss during the 7:30 p.m. City Council meeting. Students from Desmond T. Doss Christian Academy will lead City Council in the Pledge of Allegiance, and afterwards, Vice Mayor Treney Tweedy will make a presentation to the school. Desmond T. Doss, a native of Lynchburg and an Army medic in World War II, was the first conscientious objector to receive the Medal of Honor for saving the lives of wounded soldiers during an attack in Okinawa, Japan. The movie, “Hacksaw Ridge,” opens nationwide on Friday, November 4 and is based on the true story of Doss who refused to bear arms during World War II because of his religious beliefs.